We deal with a lot of property management companies and one of the more common problems when a new tenant moves into a rental property, is that they will be concerned about cleanliness of stoves, ovens, refrigerators and dishwashers. While property managers will do their best to ensure that a new rental is in top shape on move in, an area that can be problematic is a dishwasher that may have been left standing and unused for a number of weeks. Most dishwashers never completely drain water from the sump area and over time, if left standing this can lead to ugly smelly deposits accumulating. If the appliance is working correctly, calling a repair service to address this type of issue is often not the best use of your cash. Rather slip on a pair of gloves, remove the filter at the bottom of the unit and clean out deposits of whatever goodness has been left down there. Soak the filter in clean soapy water for 10 minutes, clean and reinstall. 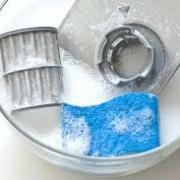 When done, pour a cup of white vinegar into the base of the dishwasher and run on a heavy cycle. Follow that up by sprinkling a cup of baking soda in the bottom of the unit and let it stand overnight. Run the unit through another cycle and consider the job done.Your unit will not only function better but should be perfectly sanitized. Repeating this every few months will ensure that the unit stays clean and hygienic.